Outlander 2.6 “Best Laid Schemes…” review: Murtagh lets Jamie know the arrngements had been made – “Two days from now… at dawn. He tells him the duel is off. Murtagh is pissed. He does not understand anything that is going on. Claire is at the hospital when the doctor/executioner asks her to finish something up for him. 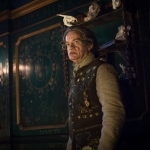 He has to go to his other job, and proceeds to explain how to draw and quarter in gory detail – “…so that the organ might be pulled forth while it is still beating.” Practitioners of dark arts are being rounded up. He says maybe she should visit Master Raymond (Dominique Pinon) for her paleness. She goes and warns him. That night, Jamie said he doesn’t owe her a life. But that he has another reason for not killing Randall yet. If anything should happen to him, he wants her to go back, “Promise me if the time should come, you will go back through the stones. Back to Frank.” We know she kept that promise. The plan to take down the new shipment begins. She shows Jamie, Murtagh, and Fergus how to make fake smallpox, and Jamie comes down with the symptoms. This may be hard to believe, but Murtagh is even more angry. “We need to tell him.” Jamie got only one punch to the face. Murtagh is a better man than I.
Jamie and Fergus go to set up the faux smallpox. It works, but the Comte and Prince found the affected men and had them squirreled away. The prince asks Jamie to fix this. 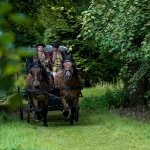 New plan (Jamie’s private plan) – have pretend highwaymen led by Murtagh steal the goods. Jamie even lets bandit Murtagh knock him out. Claire starts bleeding a little. Mother Hildegarde makes her stay the night. Jamie gets summoned to bail the prince out. Fergus goes with him and starts exploring while he waits. Camera pans on… a red military jacket. Claire comes home. Jamie went to go meet Randall. She runs as fast as a million month pregnant lady can, but by the time she gets there, they were dueling and she couldn’t interrupt. This is a magnificent dueling scene, with blades clashing, and Claire watching breathlessly and in no little pain. The fight ends when he pierces Randall’s groin. As Jamie gets arrested, they scream for each other, until Claire bleeds and passes out. There were two major scenes that fans of the book have been waiting for. 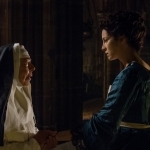 The first – The Frasers finally bringing Murtagh into their confidence about Claire’s real era. I really felt like punching Jamie’s super handsome face as well, both when I read it, and now as I watched it. Lacroix played Murtagh’s reactions brilliantly, as this grounded character accepts the impossible as possible. 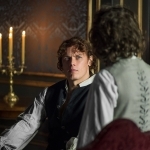 The second – The duel scene, which juxtaposed Claire, Jamie, and Randall’s pain perfectly, sets in motion the expected tragedies and the unexpected results and consequences. Jamie may not have killed Randall, but he certainly made it impossible for fathering children. Since we know Frank did not wink out of existence because of episode 1, there has to be a different explanation for why Frank still exists and why he looks exactly like BlackJack. I mean, I know why… and most Outlander fans know why. But there just may be fans out there who have not read them. The show is just as good as the books, and I rarely think that. By the way, I really, really enjoy Andrew Gower’s portrayal of Prince Charles Edward Stuart. 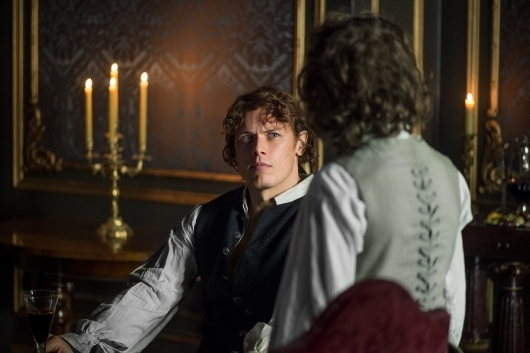 Murtagh asks Claire more about being from the future in this clip from Episode 206. 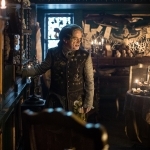 On “Best Laid Schemes…”: Jamie and Claire use Claire’s medical knowledge to devise a scheme to stop a wine deal which could fill the Prince’s war chest.